DCU is by far the best rate for motorcycles, and now I am a proud member, and will be re financing my car through them too. Thank you very much for the great service. I'm on the West Coast and telling everyone about you. New or used motorcycles at the same low rates – Motorcycle dealers and most institutions often charge you more for used  some 20% or more. 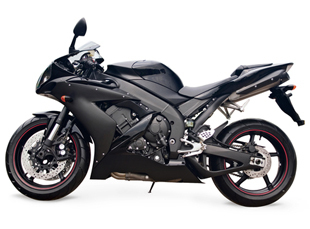 Buy or refinance – Borrow to buy your next bike or refinance the one you drive. Great rates and affordable payments – Finance up to 60 months. The longer the loan term, the lower your monthly payment. Borrow up to 120% of Price – Qualified borrowers can finance up to 120% of NADA retail book value or 120% of the purchase price  whichever is less, PLUS DCU GAP and DCU Warranty. DCU will only finance over 100% when it's DCU's GAP and Warranty, not dealer add-ons. Save with Plus and Relationship benefits and electronic payment  Save on rates when you qualify for Plus and Relationship benefits on your DCU Checking Account and make payments electronically (payment by transfer in Online Banking, Mobile Banking, Easy Touch Telephone Teller, DCU ATM, or internal DCU automatic transfers. Add 0.50% to rate for other payment methods). Qualified borrowers can finance up to 120% of NADA retail book value or 100% of the purchase price, whichever is less. * Rates are determined by your personal credit history, account relationship, and payment method. Motorcycle Loans is rated 4.7 out of 5 by 197. Rated 5 out of 5 by Dale from Very happy Was interesting, easy and professional. Loan officer was very helpful and explained all. Rated 5 out of 5 by Dave from Great Service Great Services and staff. Our loan went quickly and we we recieved a phone after we hung up to facilitate a faster way to het our check!! DCU always goes the extra mile and we will continue to be a loyal customers . Rated 5 out of 5 by Alex from Quick approval I spoke with the representative and received approval for my loan very quickly. Rated 5 out of 5 by Robert from Great customer service Great customer service excellent. I spoke to a teller and he says you got to check in. How long can a motorcyle loan be for? It took DCU about 10 minutes to process my loan application and get me approved. I am a current member of DCU and would HIGHLY RECOMMEND there services to anyone. Would i be able to purchase a used motorcycle with this loan? Purchased a 2013 HD Street Glide this week. I believe it's not the age, so much as the equity. The vehicle needs to have value today, and during the life of the financing. Can you purchase a motorcycle through private sale (not a dealer) with this loan? Looking to purchase a motorcycle through private sale, would this loan cover that? Yes you may purchase a Motorcycle through a private sale using a DCU Motorcycle Loan. If purchasing from a motorcycle from a dealership, what tag or form do I need to send to DCU before I can receive the funds in my account? I know that if purchasing from a private seller, you need to use the Intent to Sell form. But what if you're buying from a dealer? Refinanced a new motorcycle loan in about 1/2 hour and saved about $800 in interest in the process. Very helpful and knowledgeable loan officer. Couldn't be happier! "No Hassle, Quick and Great Service"
Would definitely recommend DCU to my family and friends who are looking for any type of loan for motorcycle or other vehicle. Your staff is the best. Thank you for your no hassle handling of this transaction. Auto Loan Check – Check provided for pre-approved auto loan. Makes shopping and purchasing a vehicle quick and easy. NADA Vehicle Price Guide – Get prices on new and used vehicles to help in negotiating the sale or purchase of a vehicle. DCU Motorcycle Insurance – You can count on us for good service, good value, and expert help in choosing the best auto insurance solution for you and your family. Intent to Sell Form – Provide to DCU if you are buying a motorcycle through a private sale. StreetWise Available Cash Calculator – Learn the most you should pay for your next vehicle and the amount of cash your desired loan payment will get you. StreetWise Auto Buyers Guide – Use this guide to help ensure you negotiate the best deal before purchasing your next vehicle.